Formerly: Titusville Art League, Inc.
NBAL membership dues Single membership is $40, family is $60 and lifetime mem-bership is $400. Please send a check with your dues to NBAL, P.O. Box 0613, Titusville, FL 32781-0613. General Meeting & Potluck: 3rd Wednesday of each month. Visit www.northbrevardartleague.com for prospectus and entry form. Please consider helping to promote NBAL and the arts by volunteering at one of the Friday Nites Live -- Titusville downtown street parties. They are held the second Friday of the month. We need someone to set up, break down and sit at the table. This can be 2 volunteers to do everything or several to do a small part. To develop opportunities for participation in visual art classes, workshops, exhibits, and community projects by members of NBAL. The NBAL is a not-for-profit 501(c)3 educational organization established in1961. Any donations made to NBAL are tax deductible. 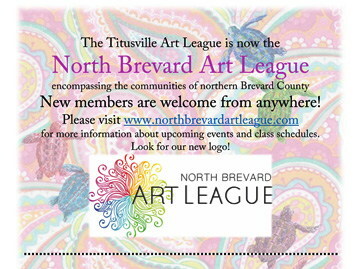 In 2018 the Titusville Art League became the North Brevard Art League. The main building and the pottery building are located at the corner of Park Avenue and Draa Street or Dixie Avenue and Draa Street, across from the Brevard Public Schools' bus compound. You cannot miss the building with the colorful mural! Open Studios are held at various times during the week. Artists (member & non-members) may come to the building to paint without a teacher. A minimal fee is charged for the use of the building. The North Brevard Art League offers classes, special days, and workshops for children, youth, and adults throughout the year. Children's Classes are offered in art and in pottery. Summer Youth Camps are offered for two weeks in June and two weeks in July and offer a wide range of classes like pottery, mixed media, collage making, watercolors, scrapbooking, and pen and ink. Adult Classes include oil painting, drawing, pen and ink, pastels, watercolors, and pottery. Specialized classes like creative cards and gift-making are offered periodically. Card-making on the computer using Publisher and Word are also available. Workshops (inside or outside, in plein air) are offered by award-winning artists from Brevard County and beyond. The NBAL supports community activities, including the yearly Space Coast Birding and Wildlife Festival. The NBAL also provides speakers and demonstrations to its membership and throughout the community when invited. Monthly Meetings are held the third Wednesday of each month at 6:00pm. A short business meeting is followed by an informative speaker and/or a demonstration of some artistic technique or method. Refreshments are served. Art in Public Places is a program that provides art work by members of NBAL at numerous businesses in North Brevard. Annual Spring Show has been held in Titusville for 49 years; 2014 will be the big "50th" celebration. Cash awards and ribbons are awarded in numerous categories for both children, youth, and adults. The event is usually held in the month of March. Membership Show has been a NBAL tradition for many years, showcasing only the works of NBAL members. This event is usually held in the fall. Poets and Painters Symposium is an annual event that pairs poems written about paintings and paintings inspired by poems. This event is usually held in the spring. 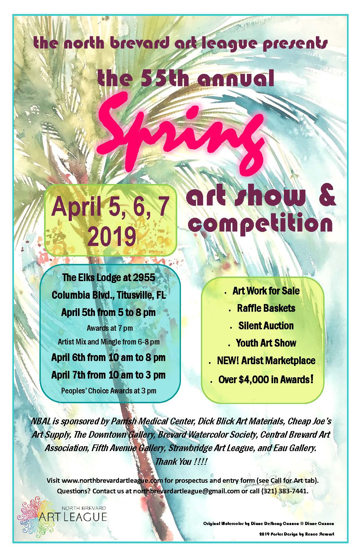 Art in the Community Rotating Exhibits Your art can be displayed at many public locations, including government offices, doctors' offices, and private businesses. "Artist of the Month" Changing themes encourage artists to be creative and compete for this accolade. The winner is chosen at the monthly meeting and his or her work is displayed in the foyer until the next meeting. Classes, Workshops NBAL offers classes for youth and adults, which affords opportunities for teaching. Workshops with outstanding artists are also held periodically. Discounts: Members receive discounts on classes, workshops, shows, and on supplies at various local businesses. Membership Show Held in the fall, this annual event showcases JUST NBAL members' art. Monthly Meetings: These meetings are held the third Wednesdays of the month at 6:00. Newsletter Our monthly newsletter keeps members current on NBAL activities, local art opportunities, and community events of artistic interest. Open Studio The open studio (no designated teacher) allows members an opportunity to gather and critique each other's work. A minimal fee is charged to defray the cost of utilities. Spring Show This annual show offers ribbons and cash awards to outstanding artists. IT'S BIG SAVINGS, LOTS OF FUN AND A MIND BENDING CREATIVE EXPERIENCE POETS & PAINTERS - Have a poem written to your painting. Paint to an author's poem. Public presentations and displays.